Danze Brushed Nickel Handheld Shower Head Wall Mount Supply Elbow Hose Connector: This Danze Supply Elbow Hose Connector is built to last. The highest quality standards are used to precision manufacturer a top of the line fixture. Important features of this 100% BRAND NEW Fixture: Complete Item! Everything necessary for installation is included. 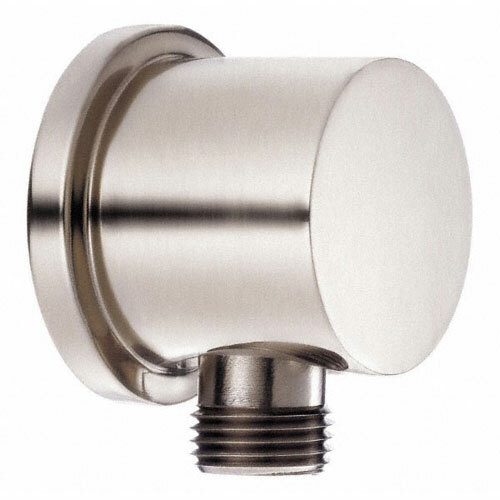 Brushed Nickel Wall Mount Hose Connector Elbow - R1 Supply Elbow - The R1 supply elbow will be a useful addition to your Shower. Its simple design will work nicely with Danze's handshower systems. Installation is easy and won't take long. - Designed to attach to handshower hose - Integral check valve included for back flow prevention - Brushed Nickel premier finish designed to resist fading and tarnishing. - 1/2 in. brass water supply connection - All metal construction will provide durability - Matching Accessories Available - Easy to Install - Installation instructions included. This fixture is manufactured by Danze and is part of their Supply Elbow Hose Connector collection. The R1 supply elbow will be a useful addition to your Shower. Its simple design will work nicely with Danze's handShower systems. Installation is easy and won't take long.